Greenville, S.C. (November 14, 2017): The Center for Developmental Services (CDS) was the beneficiary of the Ned Marshall Memorial Golf Tournament hosted by AC Controls. Ned Marshall was a beloved employee of AC Controls for 30 years and served the Upstate. Ned had a passion for helping children, and they selected CDS as the beneficiary of the tournament to honor his legacy. The tournament raised over $13,000 through sponsorships, teams and donations. The money raised will go toward the CDS lobby renovation. 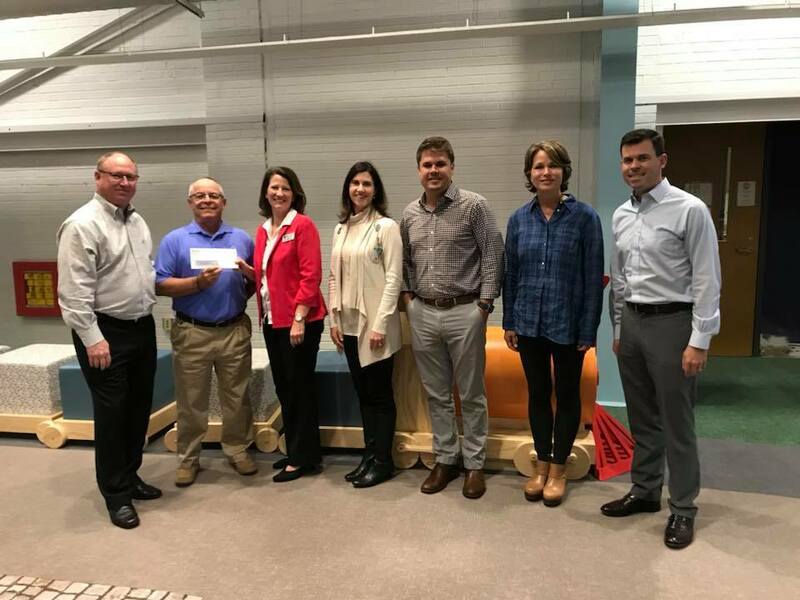 Jim Borders, Warren Leary, Andy Schmidt and Zach Marshall (Ned’s son) with AC Controls and Ned’s wife, Kim, came to visit CDS to tour the newly renovated areas and present the check. CDS is the largest multi-disciplinary treatment facility in the Upstate for children with disabilities and developmental delays. In one location, children receive services in diagnosis, therapy, audiology, school placement, day care, and a family support network. The partnership is comprised of Clarity; Family Connection of SC; the Preschool Special Education Program of Greenville County Schools; KidVentures of Thrive Upstate; and four programs of the Greenville Health System: Developmental-Behavioral Pediatrics, Kidnetics, The Wonder Center, and Prosthetics and Orthotics. CDS and its partners serve over 6,800 children and their families each year on property donated by the First Presbyterian Church at 29 North Academy Street in Greenville. For more information about CDS or its partners, visit www.cdservices.org.